Nowadays, VPN is not a “nice thing to have” anymore. In fact, it is a “must have” when surfing the web, due to the increasing number of hacking and cyber-attacks. However, there are so many Internet users still do not understand how virtual private network (VPN) works and why they should be using a reliable one. We all use Internet for a variety of reasons to get useful information, for buying stuff online and to stay updated about current national and international affairs and news etc. In all such situations, use of a trusted VPN can do a lot of good things for you. It can help keeping you anonymous online, enhanced online security, protect your payment & personal details from hackers and allow access to restricted web contents. 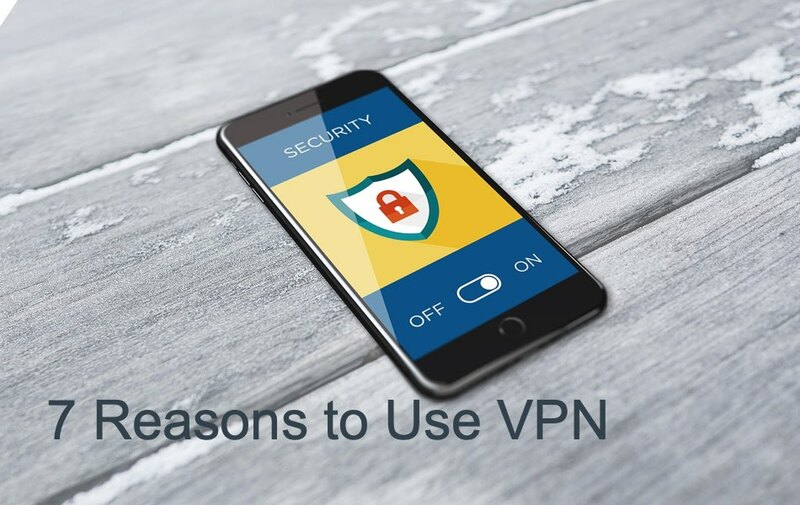 In short, there are number of compelling reasons why you should be using a VPN and seven of them are listed below here. In this digital world, your ISP (internet service provider) has complete access to your Internet history. They can sell or share the data to the digital marketing agencies to help them target the profitable audience. Use of a virtual private network helps you prevent this and provides you a safe and secure Internet browsing experience. VPN encrypts the connection between your mobile devices or computer thus keeping the ISP away from spying your Internet activities. Privacy is your right and VPN could be a great technology to provide you with enhanced online privacy. ISPs, marketing agencies even hackers can easily trace online activities of Internet users that can have an impact on your online privacy. However, a VPN can keep your IP hide from all people and enhance your online security. No doubt Google is the most famous search engine along with a lot of free services. However, if you don’t set your privacy settings accordingly, Google tracks and stores all your browsing activities. Often it can cause troubles and embarrassment for you. That is the reason; you should be using a VPN to stop Google from tracking your online activities by hiding your IP. Most of the countries do not provide open Internet facility to their citizens. They often limit internet access and also block specific websites. Moreover, if you are the resident of such country and want to bypass Government’s internet censorships to browse blocked websites, use of a reliable virtual private network connection could be the best option to do so. VPN will hide your IP to help you browse censored web resources. You will love to check emails and social media notifications by using free public Wi-Fi without knowing that it can be distressing for you. Use of open Internet provided on the public places, café, and restaurants can cause security threats and hacking. Also hackers can easily hack into your personal data and information via open and unsecured Internet connections. This review can help you to understand how a reliable VPN connection can help you browse the Internet on public Wi-Fi securely and safely. Whether you are about to use public Wi-Fi on your mobile device or laptop, remember to enhance online security by using a virtual private network. This will keep hackers and other malicious persons away from confidential and personal details. Believe or not, VPN can help you save a lot of bucks while shopping online or booking airline tickets for a business tour or family vacations. Virtual private network enables you to set the country of your choice. This will help to find the best location-based deals to shop for less than the actual price on your geographical location. Just change the location of the server where you want the shopping site see you, and avail the best price shopping deals, air tickets and hotel reservations to save money for other things. You may feel insecure when providing your financial details like credit card number or bank account in an e-commerce website or online store. However, use of a virtual private network allows you to submit financial or other confidential details fearlessly. VPN encrypts all the transferred data and no one can gain access to it. Even you can make online payments by using a VPN connection on a free or public Wi-Fi connection. Having a trusted VPN connection can help to do many things easily. In simple words, you can perform any confidential or private online activity without facing the fear of hacking or cyber security threats.